With different types of Goth, it can be hard to figure out how you should fashionably express yourself. Lucky for you, we’ve made your dilemma a lot simpler by creating a fashion guide for Gothic types. Scroll down below to check them out! Steampunk can trace its origins back to the Victorian era with a sci-fi twist. Imagine a world where everything is run by steam, gears, brass and cogs. The typical home is filled with clockwork computers and steam-powered robots. When going around everyone relies on steam-powered airships and trains. This alternative world might seem familiar because you've probably encountered them in one or two video games. Most likely, the characters invent new machines or discover new places, and as a gamer you've probably fallen in love with their world. For the uninitiated, this is what steampunk is all about. It's a future that's entirely differently from our own. When wearing steampunk outfits, remember that its style is inspired by tech and exploration. So, keep in mind the outfits of scientists, explorers, engineers and mechanics combined with a Victorian twist. This means you can wear professional outfits with Steampunk accents; such as parasols, corsets, bloomer style trousers, and frilly skirts; in early-toned colors such as brown, brass and gold. Pair it with goggles, strappy belts, and suspenders, which are usually worn by adventurers and explorers. To complete the look, add futuristic accessories such as big wenches, cybernetic arms, gem-encrusted brass earrings, war medals, test tubes, and antique keys. When it comes to accessories, the more, the merrier. The Cyber Goth is such a distinct subculture that you'll probably wonder why they're even called goth in the first place. To start off, they love black, but they also love bright neon colors. They love technology, but they're not into the Victorian trend like Steampunk fans. They also love music with darker themes, but only if they're techno or dance music. So, what makes them goth? Cybergoths love dark clothes, dark music, and futuristic steampunk fashion; however, they mix them up with elements that are not typically Gothic, such as bright neon colors or electronic dance music. While it makes them distinct, it also makes them an easy find. If you're on the lookout for a cyber goth, then go to a bar and find someone with bright neon hair or neon-colored ensembles. Chances are they belong in this gothic category. But, there's a lot more to the cyber goth look than just bright neon colors. There are absolutely no rules when it comes to the cyber goth fashion. You can be whoever you want to be. No pressure. But for those who have no idea how to dress cyber goth, take note that it all begins with makeup. The typical cyber goth wears foundation that is several shades lighter than their actual skin color. So, start with make-up that makes you look pale, but not too pale! Then, choose a wacky-colored lipstick such as black, blue or pink. Afterwards, put on some bright neon-colored eyeshadow or brightly colored false eyelashes. To complete the look wear a neon-colored wig, synthetic hair or bright hair extensions. Remember that it's not about neon, but achieving a look that is both futuristic yet gothic. When it comes to fashion, cyber goths are like most Goths, since they love black. Their outfits typically start off with black staples such as a black vest or black pants; however, they pair it up with neon-colored reflective clothing. Think neon colored fishnets paired with plain black tights. To add a futuristic element to your style, wear a gas mask or aviator goggles. Pair it with a nice pair of tall platform boots, and you're good to go. 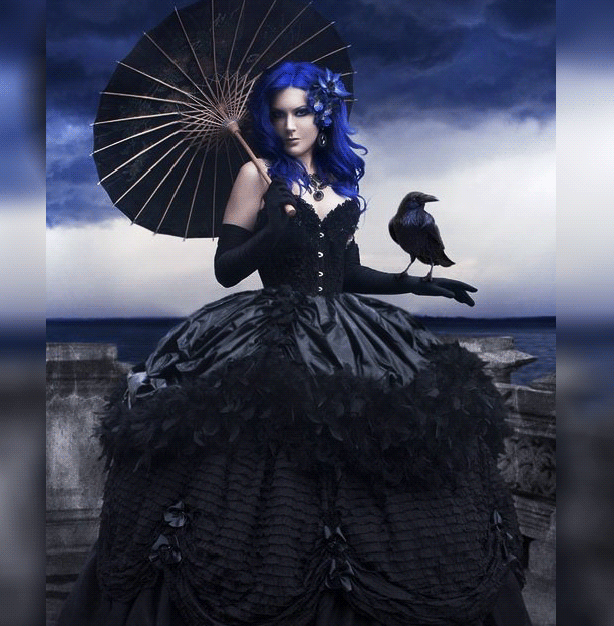 As its name suggests, Victorian goth can trace its origins back to the Victorian era. Like most goths, they love black and symbols of the occult. However, unlike most goths, they indulge in the lifestyle of high society. Think theatres, masquerades, tea parties, poetry, and literature. So, rather than rock music, you'll see them indulging in operas and classical music. They also love both art and beauty, but their idea of beautiful includes old skulls and crumbling graveyards. This means that while they love the darkness, they also maintain an aura of grace and dignity. After all, it's all about the refined Victorian era. When it comes to fashion, what sets the Victorian goth apart is its dark origins. In the past, women used to wear extremely tight corsets beneath their layered gowns, to the point that they would risk fainting. Or, they wore tons of heavy layers that made it extremely difficult to go around. However, it’s the 21st century, so you can get away with just wearing a few layers and the basics. Victorian fashion boasts of bustle skirts, ruffled blouses, lace gloves, parasols and top hats. For men, the outfit typically includes frock coats, waistcoats' and frilled shirts. Just imagine the outfit you would wear to a ballroom dance, but it has to be all-black. Since Victorian goth emulates high society, wear gem-encrusted jewels or chokers, skeleton-shaped lockets, and any type of jewelry. All Goths have an inner geek. After all, only a geek would take the time to dress up according to a different time period, read gothic literature, and collect symbols of the occult. However, some goths are geekier than others. Like most geeks, they watch anime and sci-films, play video games (i.e. RPGs, MMORPGS), attend cosplay conventions and watch Star Wars films. But, what makes the geek goth, a goth? What makes them different from a typical geek? Well, geek goths love dark aesthetics. While they may love sci-fi, they also love gothic literature, TV shows, and computer games. So, while they may love sci-fi films, they also love vampire films. What makes the geek goths a standout from other types of goth is that they care less about fashion. 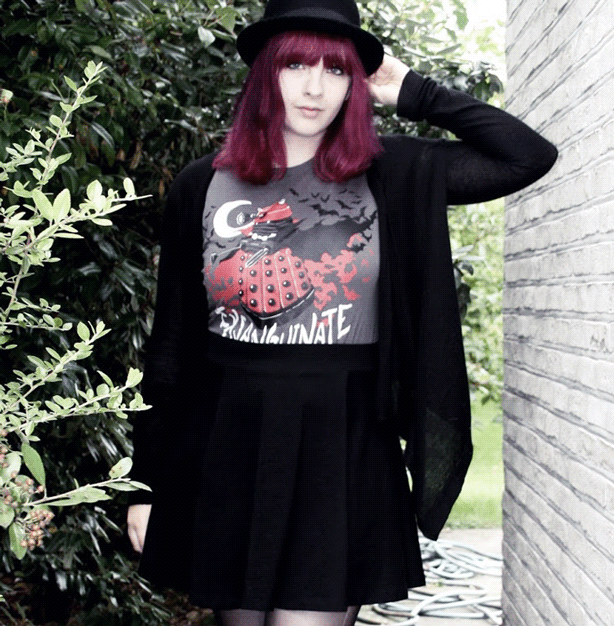 Unlike the Victorian goth, their style staples are black jeans, black boots and black graphic tees. The tee usually features a band logo, anime or a sci-film reference, or a geeky slogan. Like most goths, you may find them with unnatural hair colors, studded belts, and a bit of eyeliner. Just take note that they care less about how they look, and more about their interests. 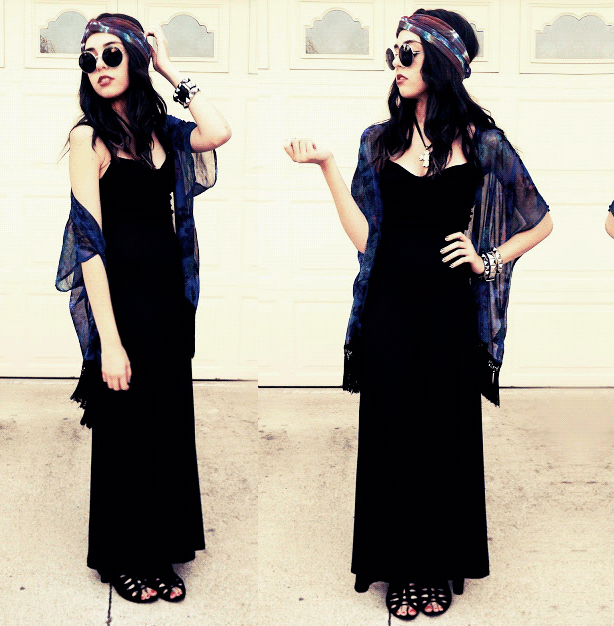 Hippie Goths are just like your typical hippie from the '60s. The first thing that comes to mind might be a guy with long-hair, eating a granola bar, with a shirt and necklace covered in peace signs. He lives and breathes nature and is a fierce eco-warrior and animal rights supporter. Plus, he believes in free love and thinks that weapons, war, and violence are a big NO. If this is how you picture hippie goths, then you're probably right. But, what makes a hippie goth different from a hippie? Well, the hippie goth loves dark gothic symbols. They read tarot cards, and they have an affinity for incense, cards and crystals. Besides that, they're just like your average hippie. When it comes to fashion, hippie goths love to stick to black. They wear lacy and light fabrics, long organza skirts, and tulle skirts. For guys, the style staples are cool hoodies and black boots. So, if you want to dress as a hippie goth, consider dark long sleeves and outfits with earthy colors. For guys, it's best to wear graphic tees with prints that are related to nature. To complete the look, accessorize with pendants, necklaces or jewelries with a reference to gothic symbols. Entering the real world sure is scary. But, entering the real world and not being able to express your sense of style, is a lot scarier. In college or in high school you probably got away with wearing any gothic thing that you want. Think gem-encrusted skull pendants, black leather jackets, black corsets, and ruffled black dresses. It was absolute heaven! However, you can't expect to wear the same outfits once you enter the corporate world. To solve this tragic dilemma, goths created the corp goth fashion. In short, gothic outfits that you can wear to work. After all, who says you can't have the best of both worlds? The most basic rule of style for corp goth is to wear black. No, you don't have to wear all black from top-to-bottom. It's just that since you're goth, there has to be black somewhere. Some of the most basic style staples for corp goth are velvet suits, black blazers, black tights, pinstripe pencil skirts, and long dark sleeves. Think stylish and formal outfits with hints of silk, velvet, and lace. The trick is to make sure that black plays a dominant role in your work ensemble. So, you can wear a red dress provided that you pair it with a black blazer and black heels. Got any more gothic types you would like to add to the list? Comment them down below!